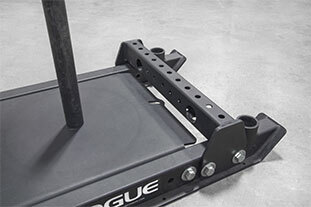 The CrossFit Games battled-tested Rogue Dog Sled comes standard with a quarter-inch steel base plate, 2x3” 11-gauge steel tubing, and a pair of 3-foot upright push bars designed to accommodate both high and low push stances. 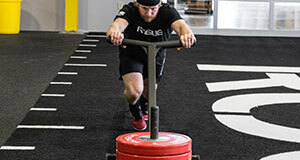 Compared to many prowler and speed sled designs, the portable Dog Sled has a smaller overall surface area, allowing you to get the most out of the plates that you own. 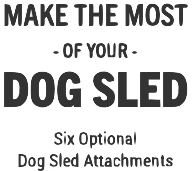 Dog Sled Bridges are 2x3" 11-gauge steel tubes that create additional mounting faces for your sled. IMPORTANT: Bridge Attachments are required if you want to add a Double Handle, Wheelbarrow, Lawn Boy, or Wrap Around Rail sled attachment. 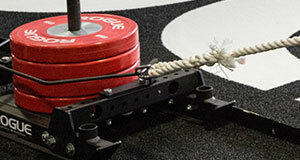 Low Bar Attachment – Measures 8-3/8” from ground to center line. 1.9" diameter handle. 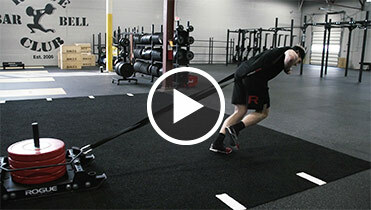 Helps keep the body more parallel to the ground, emphasizing the quads. Bolts directly to the Dog Sled and the bridges ARE NOT required for installation. High Bar Attachment – Measures 17-3/8” from ground to center line. 1.9" diameter handle. Places the user in a more upright position similar to a sprint. 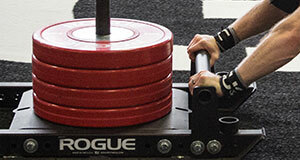 Generally easier to push than the Low Bar. Bolts directly to the Dog Sled and the bridges ARE NOT required for installation. Features two bars measuring 11.17” and 16.3” from ground to center line, respectively. Both bars have 1-3/8” diameter handles. Design allows for more height variety than a single attachment. The Double Handle Attachment must be used in conjunction with the bridge attachments. 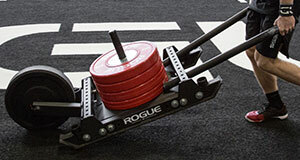 Kit includes all parts required to turn Dog Sled into loadable wheelbarrow with 500+ LB capacity. 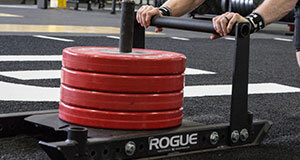 Use the provided pair of HG Collars to secure a 45 LB HiTemp bumper (or other 25+ LB plate) as the wheel (Bumper not included). The handles should sit 9” from ground when installed. The Wheelbarrow Attachment must be used in conjunction with the bridge attachments. Measures 30” from ground. 1-7/8” diameter handles. 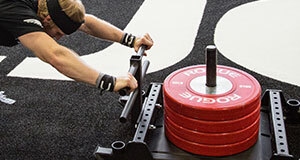 Can be used for pushing or dragging exercises, with the high placement emphasizing the upper body. A detent pin is used to install the handle for fast, easy change-outs. The Lawn Boy Attachment must be used in conjunction with a bridge attachment. Rogue Dog Sled 1.2 is rated 4.9 out of 5 by 45.